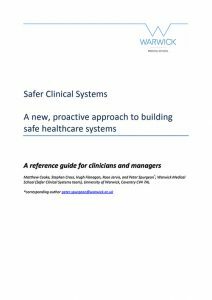 A reference guide for Clinicians and Managers by the Safer Clinical Systems Team at Warwick Medical School. It’s time to do something different in patient safety. NHS to become proactive in building safe systems for our patients. could use to support each step. In Part 2 we provide a more detailed account of these particular tools and techniques.